How to get rid of shoulder acne must be one of the most emotional and psychological pressures that most sufferers face, as you have to continually hide this dreaded skin condition, wherever you are. You feel self-conscious, embarrassed, angry, a total loss of self-esteem and self-confidence. If you suffer from the severe form of shoulder acne like nodules and cysts, which are sac-like lesions filled with dead skin and bacteria, you will feel like a social outcast, and want to withdraw and disappear from society altogether! Wearing too tight clothes, or not showering after a strenuous exercise. Sweat will accumulate under shoulder pads, brassiere straps, oil (sebum) builds up in the now-clogged pores, bacteria thrives, and whiteheads, blackheads appear. This is called "acne mechanica". Bleaching your clothes will cause this acne to get worse. If you have sensitive skin or are allergic to certain shampoos, hair conditioners, these trickled down your shoulders and back when showering, and if not wiped and dried properly, the reaction will cause acne breakouts on the shoulder and back. Antibiotics like penicillin, doxycycline and co-trimoxazole (the last also prescribed by dermatologists to treat face acne), will cause breakouts of pimples and pustules mainly on the shoulders. A form of yeast - known as Malassezia furfur - can grow on the shoulders, and cause acne-like breakouts here. A severe form of acne - called Acne Conglobata - occurs on the shoulders, back and face, usually in men aged 18 to 30. Here, large lesions appear all over. How To Get Rid Of Shoulder Acne In these Cases? Wear loose-fitting cotton shirts and loose collars. Avoid bleaching and add fabric softeners when washing your clothes. Change your shampoos, hair conditioners until you get the right combination. Don't use penicillin or any antibiotics. 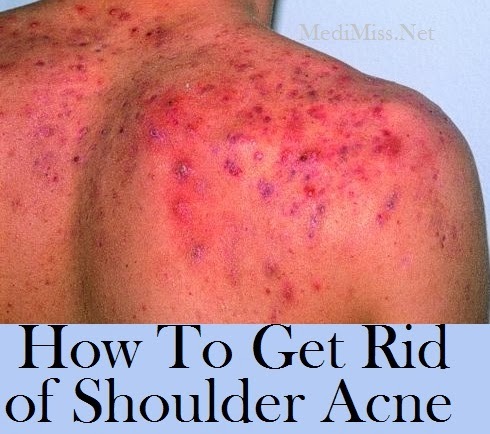 Your shoulder acne will clear up when all these changes take place. Most of the treatments that work for acne on the face - such as antibiotics, tea tree oil, Retin-A, Tezaroc, Differin, cleansers, nourishers, exofoliants, skin peels etc - have little effect on shoulder acne. Besides such temporary cures, they are expensive and have many serious side effects. When shoulder acne is accompanied by other acne conditions elsewhere on the body, the underlying causes are usually hormonal and genetic factors. Moreover, stress is the one major cause of all acne conditions. Daily walks, more exposure to sunlight, and more sleep will greatly improve all types of acne cures. For example, walking increases your lifespan, helps lower blood pressure, keeps your mind sharp etc. All these methods are inexpensive, free of drugs and antibiotics and - stress-free!